My name is Claire and I live in Sutton Coldfield, Birmingham. I have kept rats as pets since 2000 and I started breeding in late 2011. 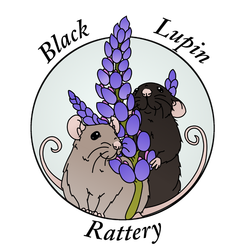 I'm a member of the NFRS (National Fancy Rat Society) and the MRC (Midlands Rat Club). In April 2015, I was awarded the MRC Quality Breeder award and in June 2015 I earnt my NFRS Stud name. The name Black Lupin comes from my favourite Harry Potter Characters 'Sirius Black' and 'Remus Lupin'. It also happens to relate to one of my favourite rats. Ratty Rascals Lupin (RIP) she was a Black Dumbo and started my love of that variety, which I plan to breed. I have recently decided to breed Marked rats again, with the aim to make Capped and Variegated. If your interested in any kittens, please fill in the contact form on the Current Litters page. You will be sent a Kitten Application Form to fill out and then could you please send it back to me. You can usually find lots of photo's of my rats and kittens on there.